We had everything from blankets to submarines and baby sweaters last week. If you missed all the great shares, it’s not too late to go back and check them out on my ELK Studio Facebook page! I start today’s “Making it thru Monday” feature with Maria from Pattern Paradise. 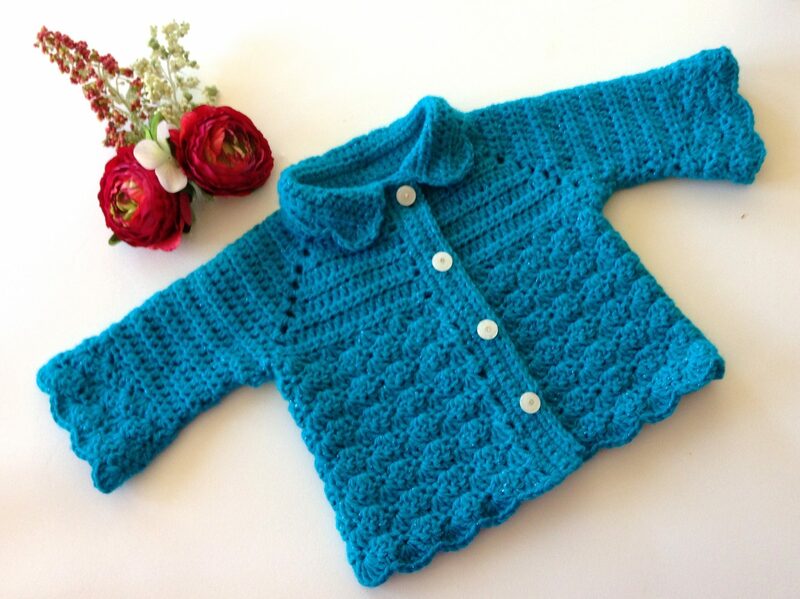 She submitted this great little sweater she designed, and it would be precious on that little one you love so much. Maria has this great pattern and so many others one too, and I urge you to take a few minutes to check out her Facebook page and blog. She is very diverse in what she designs, but a must see is her great Zig Zag hat that with the help of Wendy from the Hooked Haberdasher is now a fantastic slouchy hat that turns into a cowl.! Awesome pattern! Here’s the picture of the sweet sweater that made it to the most viewed on “Making it thru Monday”. The other great submission came from Elizabeth from Crocheted Cuties by Elizabeth. 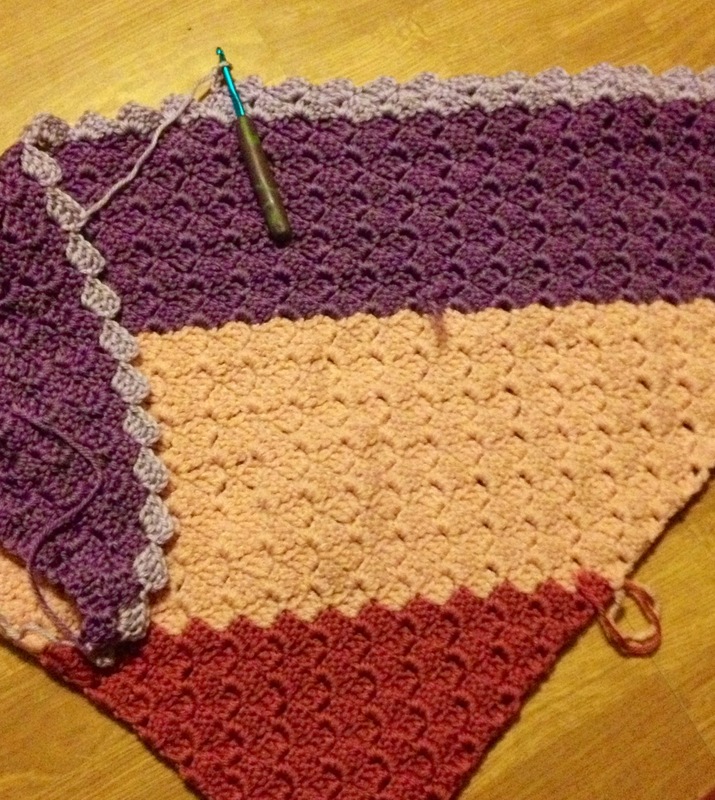 The shell pattern for this awesome blanket came from her grandmother years ago. What a great tribute to your grandmother Elizabeth! Everyone on the page always loves the blankets, and I’m guessing it’s because as a crocheter we all know how much time it takes to create this beauty. I can’t wait until she comes back and shows us the completed project. Elizabeth is also very talented in her creations and has one of the cutest models (her daughter). You should also spend a few minutes scoping out her Facebook page. Here’s her WIP. Once again “Making it thru Monday” was successful. 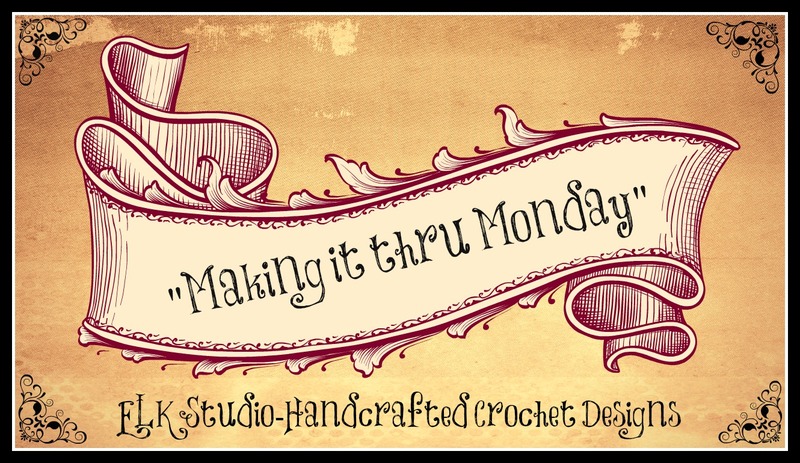 If you would like to show off your project, you can email me at elkstudiocrochet@gmail.com. Don’t be shy or think your project isn’t good enough. You will find lots of encouraging people ready to see your fantastic work! Thank you Kathy for hosting such a wonderful feature each Monday. It is a great place for us to “show and tell” about our latest works and I love seeing and reading each weeks contributions. Great work Kathy! It’s great work Elizabeth. Thanks for submitting the project.